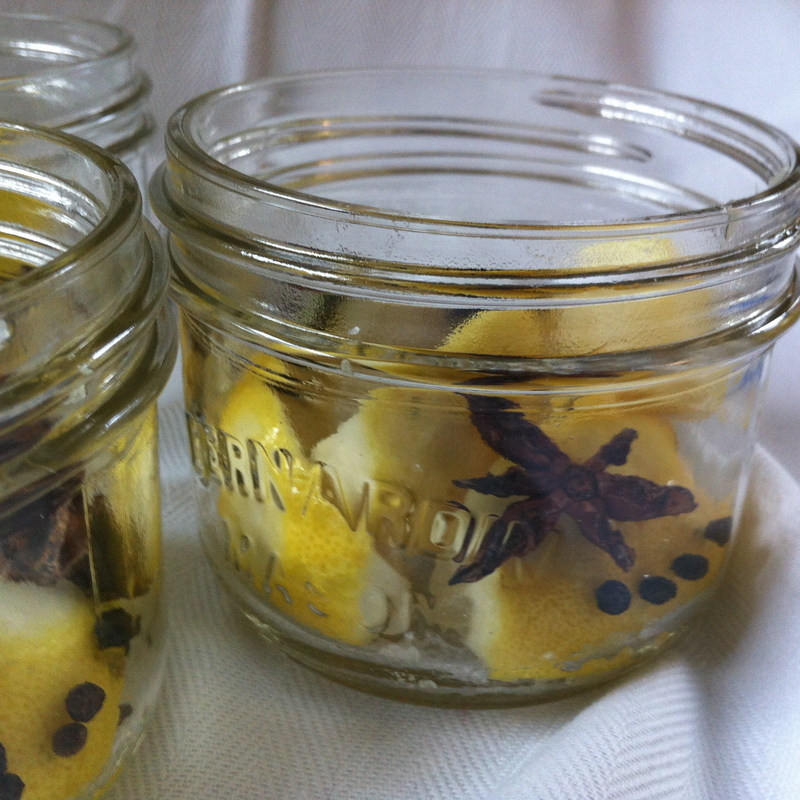 Preserved lemons are a fairly new thing to me. I had heard of them before, and I’m sure I had eaten them, but until last year I had never really thought about them. What a fool was I. A staple in Moroccan cuisine I’ve been trying them with everything from grilled pork chops to salad dressing. They add a delightfully bright and tangy flavour. Now I don’t have a lemon tree (sob) so I can’t pretend that they even come close to an eat local or 100 mile diet edict, but sometimes rules are worth breaking. Thankfully my local market frequently has good quality organic lemons (and occasionally even meyer lemons when in season! ), so when they do I grab a few bags, preserve them and save them for a rainy day. Sunshiney, fragrant and simple. Here’s what you need. Plus: sterilized mason jars/lids of desired size. I like using wide mouth 250 and 500ml jars. You can use small neck jars if they are smaller, but for the larger jars it makes it too difficult to pack them in. Wash and scrub all lemons. Cut the ends off the lemons (just to point of seeing “pulp”). Cut in half lengthwise and then thirds. (note: some people recommend leaving them whole and just cutting large slits in the lemons – I have found I don’t want a whole lemon when I’m using it). Put all lemons in a bowl and sprinkle with salt. For 10 lemons you will need approximately one cup of salt. 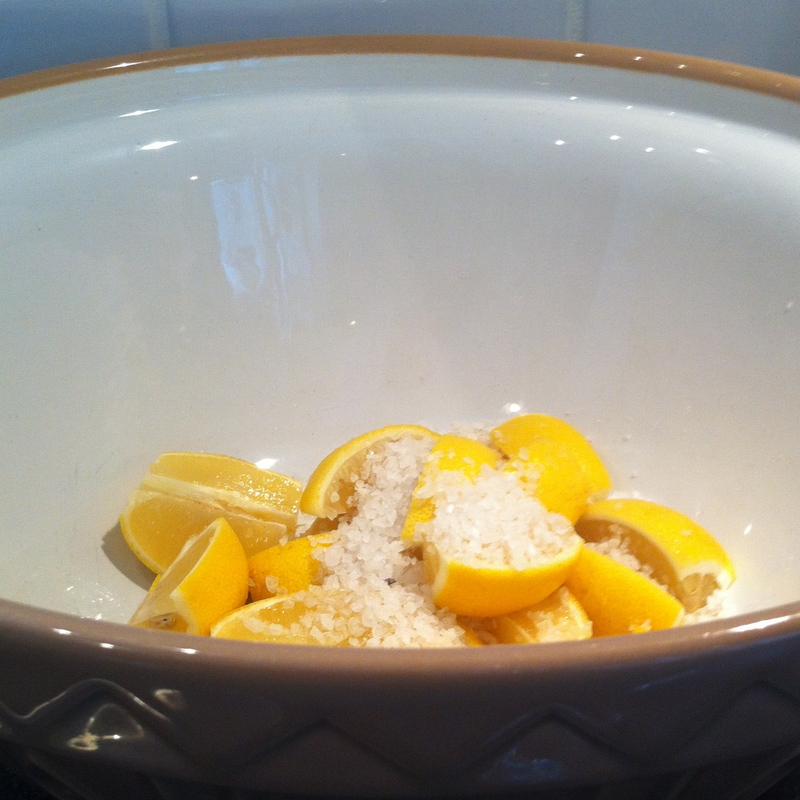 Muddle the lemons and salt together (I just use my hands – messy but smells SO good). Pour enough salt in each jar to cover the bottom. 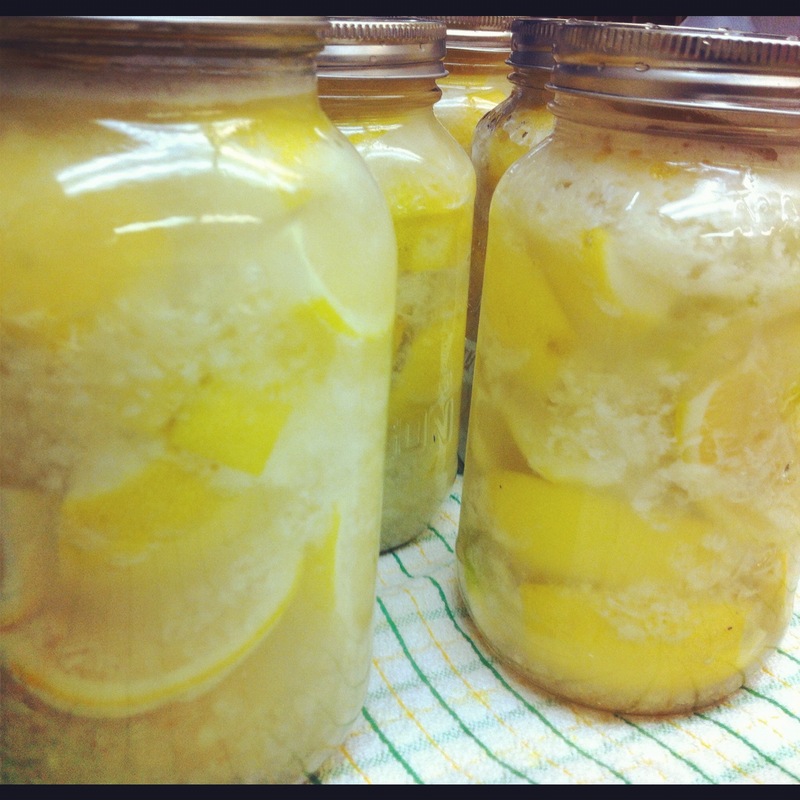 Pack the lemons into the jars, rind side out. Pour in a teaspoon of salt between every layer or so. If you are adding spices, place bay leaves &/or star anise on the outside of the jars, and sprinkle pepper ad hoc between the layers. Squish the lemons down as much as possible. You want the juice to ooze out. If necessary, add lemon juice until all of the fruit is covered. Gently pour olive oil on the top of each jar. Just enough to cover the juice. Seal with a lid. Place in a dark cool place for at least a month. I gently shake them about once a week. When using them many people rinse and then just use the rind, but I’ve been using the whole thing with great results (although higher sodium). This entry was posted in Cooking techinques, Food, Fruit, Preserves, Recipe and tagged lemon, olive oil, preserves, sea salt, spices by mostlynoodles. Bookmark the permalink. never thought of doing this. super cool. They are so deliciously wonderful – let me know if you try them! Meghan, thanks for sharing such great recipes. Way too funny — I bought 2 bags of lemons just yesterday to preserve them! My recipe is more Indian than Moroccan — think chilli powder and garam masala. Cook up a big pot of curry (veggie or meat), toss a jar of lemons on the table, and winter becomes a little more bearable. yum! I made some preserved lemons last year and put them in a lamb sausage with lots of black pepper, garlic and a few other spices. Delicious! It was so great to meet you the other night too – what a great meal! The sausages sound amazing. 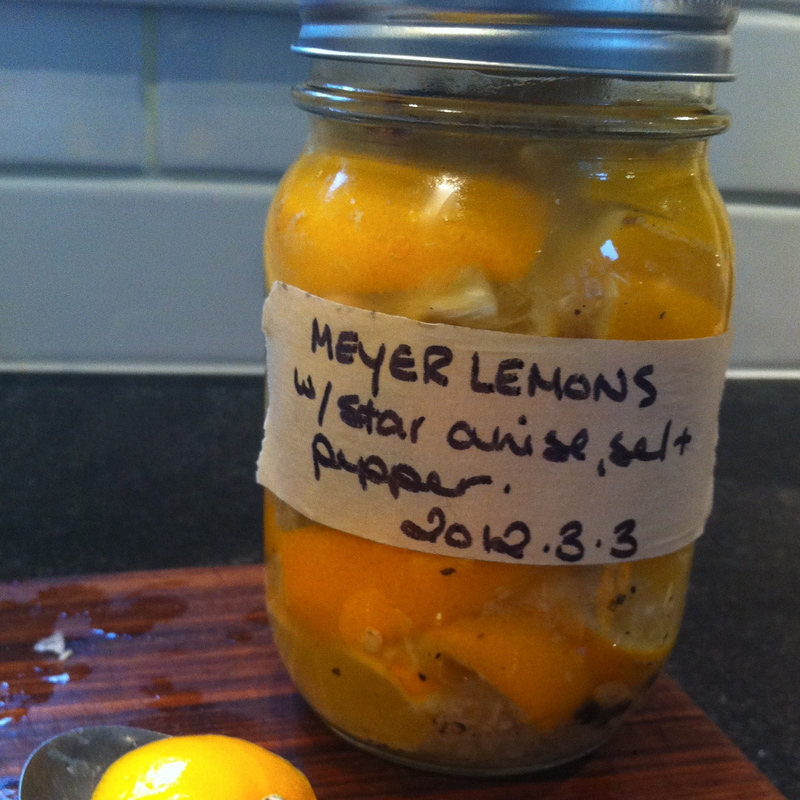 Let me know what else you make and stay tuned for some of my experiments on the blog. They look so pretty in the jar. I’d love some suggestions on how to use them in a veggie dish. From your comment to my blog – stay tuned my friend!